This pump has it going on! The Topeak Micro Rocket AL MasterBlaster Aluminum Bicycle Pump is not just a good looking bike pump, it also works on just about any bike tire you can throw at it with its high pressure capacity (160psi/11 bar), while adding very little weight (65g/.14 lbs.) because of its strong, yet light aluminum body. This pump is great because it’s easy to carry around with you since it’s so small (it’s roughly the length of a remote control) and light. It’ll be there for you so won’t let a flat cut your ride short or delay you from getting to your destination. There’s a con with all small bike pumps, this has to do with physics, because of the smaller body size, there’s a limit to how much air the pump can get into your tire each time you pump it, this means you will have to work a bit harder to get your tire filled with air, but unless you want to carry a less conveniently sized pump with you this is your best option, on the bright side, you’ll get a light arm workout when you use this bike pump on your fixed gear and you will look cool doing it. It’s a single-action pump, all this means is that it pumps air into your tire on the push stroke and not the push and pull stroke, this is in contrast to a dual-action pump which fills your tire with air on BOTH the push and pull strokes. I like single-action pumps more since it’s awkward having resistance on the pull stroke, it’s easier to push the pump handle (single-action) than to pull AND push (dual-action), since you have more strength pushing than pulling. It’s also got a locking handle which keeps the pump from opening up while you’re riding, this can help you avoid damaging the pump while it’s in your bag or pack. 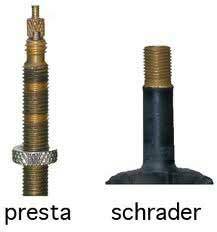 One last NOTE that you need to be aware of, this pump only works on PRESTA valves and NOT SCHRADER valves, which are the big chunky valve, so if you have that kind of valve you can check out this schrader & presta valve compatible bicycle pump that works on both schrader and presta valves (picture of presta vs. schrader valve). Buy one online for yourself HERE or if you’re looking for a great gift idea that will be appreciated buy two (one for your friend and the other for you). If you want an even lighter one (that’s also more expensive) check this carbon fiber bike pump out. It’s 10 grams lighter than the aluminum one. To give you an idea of what 10 grams feels like go pick up 4 pennies, 4 pennies = 10 grams, that’s not much more extra weight to carry around, but if you’re the type that’s looking to shave off a few grams here and there the carbon one could be the one for you.